Rotis and Parathas to lower your Cholesterol levels. Indian breads. low cholesterol rotis. low cholesterol parathas. Rotis and Parathas are unleavened flat breads made on a tava. They form an indispensable part of an Indian meal. They can plain, all in one or stuffed – but one of it is a must cooked in every household every day. In this section you will find a variety of flours have been used to makes Rotis and Parathas so you can benefit from their fiber content. Just remember to knock out maida and all purpose flour completely from your pantry. Try a variety of these Indian breads shared in this section for a wholesome and pleasurable experience each day. Bear in mind to avoid too much oil on top of these rotis and parathas as that would add on to the Cholesterol content, which is absolutely not our prerequisite when aiming to regulate the blood cholesterol. Bajra is rich in Magnesium which improves insulin response by lowering insulin resistance which is good for Diabetics and a healthy heart. So include bajra roti, bajra and cauliflower roti and low acidity roti in bajra peas roti. Why use jowar to curb cholesterol in rotis and parathas? Jowar is a complex carb and will be absorbed slowly in the blood stream and not cause a spike in insulin. Jowar and all Millets are rich in Potassium. Potassium is critical for those with High Blood Pressure as it lessens the impact of sodium. Hence a good safe food for diabetics and also for those who want to live and eat healthy. Being high in Fibre, Jowar reduces bad cholesterol (LDL) and increases the effects of good cholesterol (HDL). Jowar roti, low acidity jowar bajra spring onion roti and mooli jowar ki roti are some excellent options to lower cholesterol. Matki jowar paratha is made from jowar and whole wheat flour. Cabbage is low in calories, relieves constipation, good for diabetics. Suggested recipe is cabbage jowar paratha which is gluten free. Bajra gajar palak paratha uses spinach which is very rich in insoluble fibre, 25% having soluble fiber and 75% insoluble fiber. Spinach is good for the heart, diabetics and eyes. Carrots relieve constipation, lower blood pressure, have fibre and lower cholesterol. Opt for a nice healthy and filling cauliflower methi paratha. Try them and you will never be tempted to eat those unhealthy plain flour rotis and naans again. Enjoy our low cholesterol rotis. 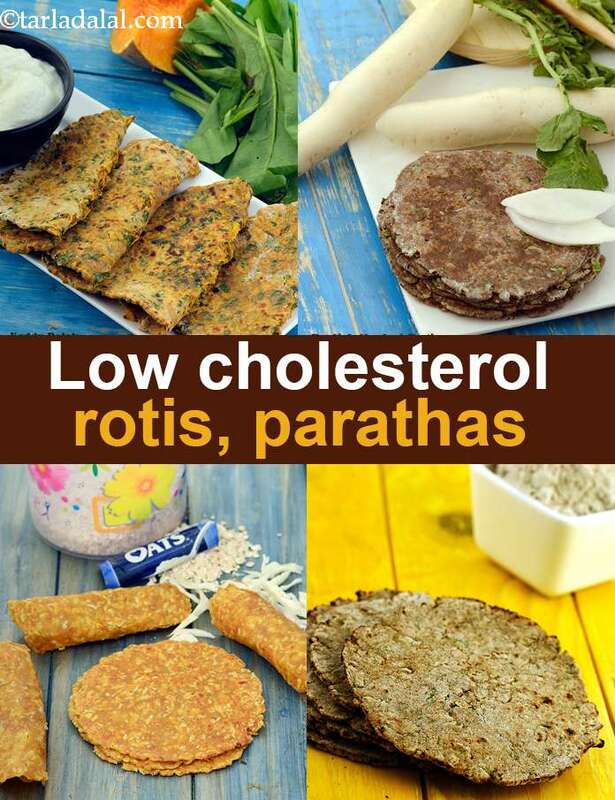 low cholesterol parathas and other cholesterol articles below. This roti is a simple way of disguising methi in your regular meals. Methi is an excellent source of iron and vitamin A and is really low in calories. Fresh green chillies add pungent accents to these rotis. A simple yet mouth-watering delicacy made by combining 2 fibre laden ingredients whole wheat flour and soya flour, to keep a check on your blood cholesterol levels. Try out one paratha and you are sure to be tempted to go for a second one. Soya flour, ragi flour and jowar flour combine to make these mildly spiced parathas. These flours are not only gluten free but also a good source of iron, calcium, fibre and protein.